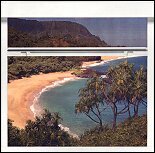 Roll-Away Retractable Window Screens. The screens retract discreetly away when not in use giving you a clean unobstructed view. Now you can open up your home allowing cool air in while keeping insects out.. 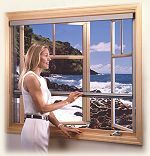 Window frames will sometimes vary from side to side (width) and from top to bottom (height). When measuring the inside dimensions of the frame in which the Roll-Away® screen will fit, be sure to measure the width of each frame at the top, middle and bottom. For each height measurement measure at the left and right side of each frame opening - see diagram A to the right Measure to the nearest 1/16". When ordering always use the smallest of each dimension. In diagram A the measurements you should record would be 21" x 48", as 21" is the smallest width and 48" is the smallest height. A 1/16" deduction in width and height demensions are necessary for a proper fit. Therefore, Retractable Window Screen would be manufactured to measure 20 15/16" x 47 15/16"
Measurements: Give the exact desired to the nearest 1/16". Fabrication tolerances +0", 1/16"
Screen:Pool, Patio and Porch Screen is stronger than standard window and door screen, making it the ideal screen for large openings such as screen porches, and patio and pool enclosures. Designed for applicataions where extra strength is desirable. Screen:Phifer Bronze Screen is made of 90% copper and 10% zinc to provide strength and durability. This screen weathers to a beautiful dark bronze finish. FOR HOME, HOUSEBOAT, SAILBOAT, RV, COMMERCIAL BUILDING. All frame components are top of the line extrusions with baked on thermal setting polyester enamel finish. Screen and Draw Bar move freely in aluminum extruded guides on each side of the window, allowing for smooth operation while keeping the screen in place. Well designed spring construction coupled with the Roll-Away impact bumper keep the drawbar from damaging the housing and working smoothly for years. Roll-Away® screens are custom made and are available to fit practically every type and size window. When not in use they are rolled up like a window shade, giving an unobstructed view. You need only a measuring tape, drill, hack-saw, file and a screw driver. You can install-it-yourself in less than an hour. Its easy! all hardware included. Roll it out of the housing when your door is open. Roll it back into the housing, away from dirt, damage and view when your door is closed. Low Profile architecturally designed housing and frame blends with existing doors. When not in use the screen is concealed in an overhead housing which contains a spring, roller and bearing assembly for smooth operation. Constructed with Genuine Phifer Wire Insect Screen. Insuring insects stay out while fresh air comes in.